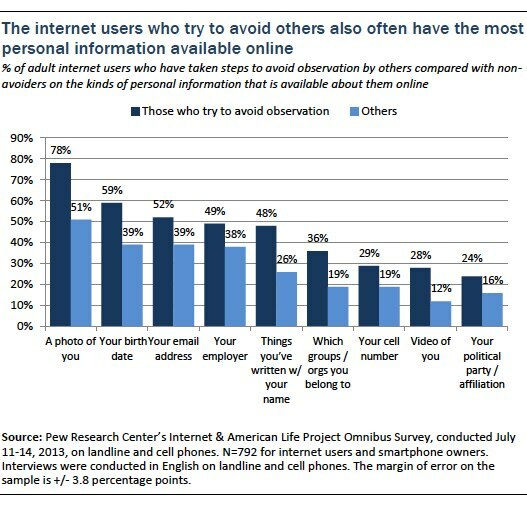 Overall, 55% of internet users said they had taken steps to avoid being observed by at least one of these types of people or organizations. It is worth noting that considerably more people take steps to avoid advertisers and unpleasant social observations than take steps to avoid detection by their employers or by government or law enforcement. Again, the most important, consistent differences in avoidance behaviors online are tied to age. 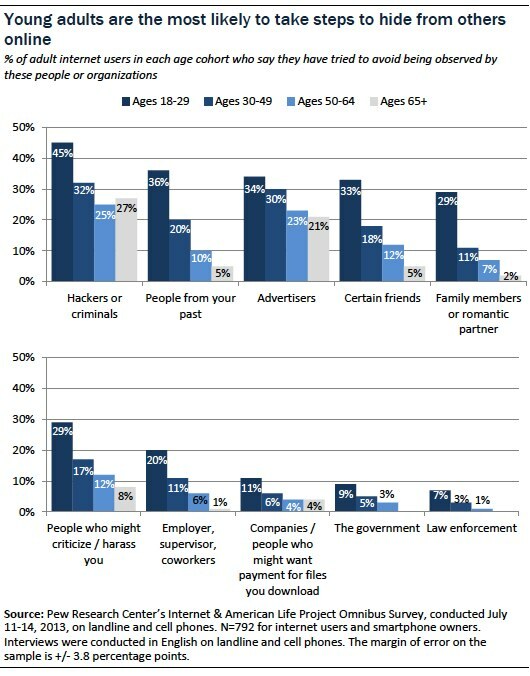 Young adults (those ages 18-29) are more likely to have tried to keep from being seen online by most of these potential observers than older users of the internet. The survey also showed there are times when online men and women have varied as they take steps to avoid being seen by others. Online men are more likely than online women to try to avoid detection by advertisers (33% vs. 24%), to try to avoid observation by those who run the websites they visit (9% vs. 4%), and avoid being observed by law enforcement (6% vs. 1%). On the other hand, online women are more likely to say they have used the internet to keep from being observed by people from their past (23% vs. 16%) and by certain friends (23% vs. 14%). One of the most revealing contradictions in the results of this survey is that those who have taken steps to try to avoid observation by others (e.g. tried to avoid hackers or advertisers or people from their past) and those who have taken more general steps to be anonymous (e.g. cleared cookies, used fake names, used encryption or VPNs) are more likely than others to have each of these items of personal information posted online. This reinforces the notion that privacy is not an all-or-nothing proposition for internet users. People choose different strategies for different activities, for different content, to mask themselves from different people, at different times in their lives.